How to convert web pages to PDF files? 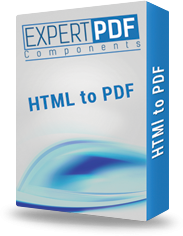 With ExpertPdf HTML to PDF Online converter is easy to turn any web page to PDF in a few seconds. Easily convert HTML web pages to PDF files that capture the real look of the pages without the need to install Adobe Acrobat. 1. Go to the online converter page: HTML to PDF Converter. 2. Enter the url of your page and click "Convert to PDF". Note: The url must be accessible from the internet. Some additional options can be configured. 3. View or save the generated PDF document. Prices starting at $550.00 for ExpertPdf HtmlToPdf Converter Developer License. The HTML to PDF converter can be used in any ASP.NET MVC application. ExpertPdf sample code for Html To Pdf Conversion in ASP.NET MVC.